In our last post, we took the opportunity to emphatically de-bunk some myths about HVAC systems and maintenance that could be described as nothing other than…bunky. If you’d like to take a look at the post about debunking the top HVAC myths, feel free! But for the purposes of today’s blog post, we’ll briefly summarize a motif of said myths: most people don’t think that HVAC maintenance is important enough to bother with. In reality, routine HVAC maintenance performed by an HVAC professional will often lead to prolonging the lifespan of your HVAC unit while ensuring that you get maximum efficiency at the same time. Today’s post, as the title already gave away to some degree, is all about understanding HVAC repair, maintenance, and HVAC service agreements. If you are in Cincinnati and are wondering about the best way to get the most bang for your buck when it comes to your HVAC unit, read on! This post is for you. If you live in or around Cincinnati and are in need of professional HVAC services, look no further than Electric Masters. Seeing as how it’s the new year and the temperatures are falling like a rock here in Ohio, we hope that you’ve already taken care of your heating needs before the season started. On the other hand, we’ve run into plenty of circumstances where old HVAC units break in the middle of the season, leaving homeowners and their families left out in the cold, for want of a better expression. Or it might be the case that your HVAC system hasn’t completely failed you, but it fails to make your home as comfortable as you’d like it to be. This just can’t be, if you ask us. Most all of us work hard, and at the end of a long day we all deserve to have a home where we can relax and unwind. Plus, inefficient HVAC systems lead to pricey energy bills — a financial headache you can do without in 2019. If you need professional HVAC service, for repair or a full-on replacement, we’ve got you covered at Electric Masters. We have over 20 years of service experience under our belts, so let us put it to good work for you! HVAC repair might be an unexpected and unpleasant expense you have to account for. After all, you have to keep you and your family warm, so getting your system fixed is compulsory. And while the unanticipated bill might set you back a bit, getting a brand-new HVAC system might really grind your gears, especially if you thought your system was operating smoothly. It makes your home or business more comfortable. It helps prevent the need for costly repairs in the future. It protects your home or place of business, especially during the cold winter months. It often leads to monthly savings on your energy bill, especially when you change out your used air filters for fresh ones. It safeguards your HVAC system warranty. It improves the indoor air quality in your home or business, leading to healthier, happier people inside them! Why Should I Get An HVAC Service Agreement? One of the biggest myths we dispelled in our previous post was that routine maintenance of an HVAC system is not necessary. While it might be tempting to think that an HVAC professional is trying to convince you to sign up for routine maintenance via a service agreement simply because they want to make a buck, but a service agreement is one of the most important elements of keeping your system in good operating condition. The fact of the matter is that HVAC systems are not simple things — they are robust, complicated machines with a number of moving parts that all need to work in concert for the system to function correctly. In the same way that your car might need a routine oil change, tire rotation, or brake check, your HVAC unit needs consistent upkeep performed by an HVAC professional. When you sign up for a preventative maintenance contract with HVAC professionals like us at Electric Masters, you get the assurance of having regularly scheduled inspections to swap out your air filters and ensure everything else is running properly. This way, you’ll save money by avoiding costly repairs and replacements. You might have heard that service agreements are a waste, are too expensive, and are peddled by companies that clearly have a horse in the race. At the end of the day, however, we’d argue that your Cincinnati HVAC system is an investment worth protecting. Electric Masters provides HVAC maintenance plans that are affordable and simple. We want to set our customers up for success when we provide HVAC service, not hamstring them to a contract they don’t actually need! 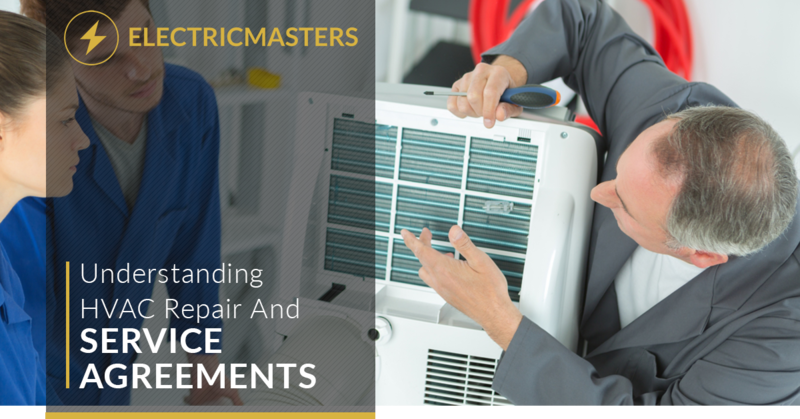 If you are in need of HVAC repair, replacement, or are interested in signing up for a service agreement, we’ve got you covered at Electric Masters. Whether your needs are commercial or residential in nature, we have the experience and price point that you are looking for. Schedule your appointment today!